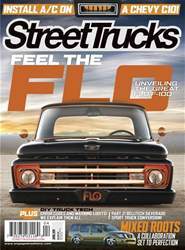 Digital Subscriptions > Street Trucks > April 2019 > FLO Airride Mfg. IF YOU’VE BEEN IN THE CUSTOM TRUCK SCENE OR AUTOMOTIVE INDUSTRY FOR ANY AMOUNT OF TIME, YOU’VE MOST LIKELY HEARD THE NAME MIKE ALEXANDER MENTIONED IN THESE PAGES AND ACROSS OTHERS. Along with countless magazine features under his belt, there’s the ongoing car show jokes between friends about not finishing rides, killing Mini Truckin’ magazine, etc. But, of course, the more serious talk includes some amazing designs and builds, thousands of editorials, launching Slam’d Mag, bespoke air-ride products and more—Mike has definitely been around the block with more than two decades of personal and professional involvement in the custom automotive aftermarket.